When the legendary “Nine Old Men” that had been at the House of Mouse from the very beginning alongside Walt Disney began to retire in the midst of the studio’s creative slump of the 1970s, the young artists that execs hoped would take their place became known as “the new breed” of Disney Animation. Walking out of the animation building along with nineteen other frustrated artists and his studio-rejected NIMH project, Don Bluth – the uncredited assistant director of such masterpieces as Sword in the Stone and Sleeping Beauty – hired his colleagues and formed his own studio where NIMH became the company’s first feature film in 1982. Aspiring to produce a non-Disney effort in the Disney tradition, Bluth’s team set out to augment what they loved most about Walt’s classic works, emphasizing old-school craftsmanship while simultaneously incorporating new techniques to bring a more cinematic approach to full-length animation. Honoring the qualities that had begun to fall by the wayside in Disney’s cheaper, faster ‘70s style of blending minor animation into silly live action productions (Pete’s Dragon, Bedknobs and Broomsticks), the artists displayed a superb attention to detail and a gorgeous color scheme. 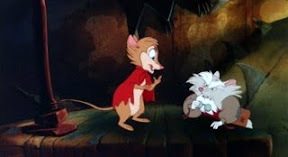 Instead of relying on a minimum of static backgrounds, which had long been the status quo for illustrators working in the field, NIMH ’s overly ambitious animators staged a bold creative rebellion, drawing from a palette of more than 600 colors to comprise a whopping 1,078 backgrounds for the 83 minute feature. 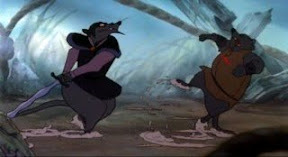 While the special effects desired for Bluth’s directorial debut had long been taken for granted in the realm of live action, as an animated endeavor, it took nearly two years to design and build state-of-the-art cameras capable of shooting backlit art and achieving NIMH’s groundbreaking split exposures to create shadows and experiments with translucency, diffusion and reflection. 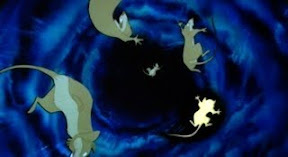 Despite the relatively bizarre premise that centers on genetically altered “smart” rats that have escaped from “NIMH” the National Institute of Mental Health, screenwriters Bluth, John Pomeroy, Gary Goldman and Will Finn stayed true to the Disney favored, kid-friendly myth-inspired Hero’s Journey paradigm in their adaptation of Robert C. O’Brien’s Newbery winner, Mrs. Frisby and the Rats of NIMH. Nonetheless, considering that even the filmmakers were surprised that a film with serious and slightly intimidating overtones received a "G" rating rather than a more suitable "PG," parents may want to preview this work before screening it for children. 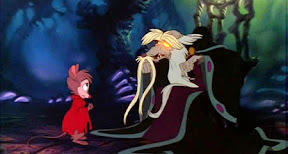 Admittedly although it takes awhile to fully appreciate the story-within-a-story element and even longer to see the actual villain since the writers infused this version with a slightly confusing mystical element that's foreign to the source material, overall NIMH is an engrossing if flawed work. 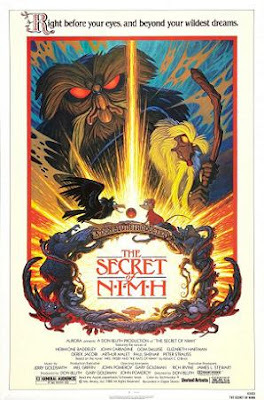 While in retrospect it's the first film I remember watching as a child, I can now safely say as an adult that The Secret of NIMH is likewise one of the strongest movies to have ever been created outside Walt Disney Animation. 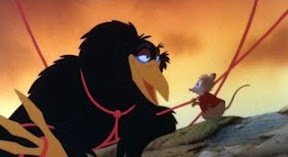 And as such, NIMH ranks as one of the medium’s most influential productions of the twentieth century, ushering in an era of tremendously diverse animated pictures around the globe, inspiring likeminded innovators at studios old and new (including Disney) to take a second look at the history of the genre to construct its future. 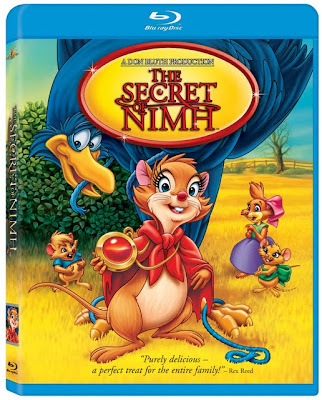 Though NIMH was easily overshadowed by easily overshadowed by Spielberg’s E.T. in its ’82 theatrical release, Bluth's best was yet to come in the form of his collaboration with Spielberg, resulting in the instant contemporary kiddie classic, An American Tail . While it was a blast to revisit a film I haven’t seen since my youth, especially given the chance to hear Jerry Goldsmith’s impressive score for the first time in high definition and with the bonus of filmmaker commentary, unfortunately the lackluster MGM Blu-ray visual transfer of NIMH is roughly on par with my memory of the '80s VHS version. 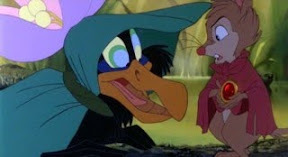 Perhaps next year they can try again to unveil NIMH in its thirtieth anniversary glory… in the hopes that maybe it’ll inspire a “new breed” of revolutionary filmmakers to walk out of their uninspiring studio gigs to make movies that matter.